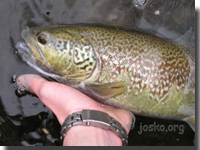 Marble or marbled trout (Salmo trutta marmoratus, Cuvier 1817) is a special form of brown trout that is estimated to be only native to rivers of the Adriatic river system. 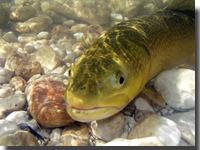 Although it can be found in waters from Italy down to the end of Albania, many Slovenians still cherish this beautiful creature as THEIR trout! This is more than unfair to our brown trout (Salmo trutta f. fario) that is also native in majority of our rivers, but the uniqueness and mystery that surrounds this beautiful marbled “subspecies” is constantly echoing in heads of our ichtyologists and fly fishermen. 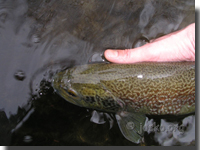 The most known rivers that inhabit this “kind” of trout are Soca (pr. Sotcha, or in Italy Isonzo!) and Idrijca (pr. Ydrytsa) with their tributaries. 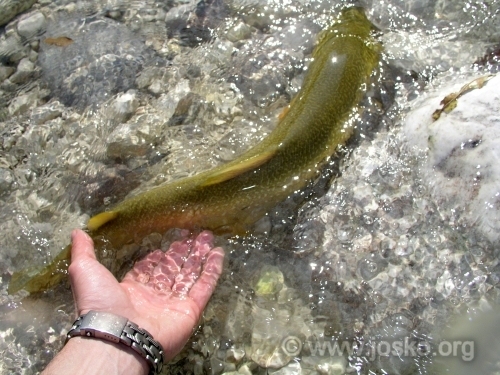 Soca is the river after which Slovenians named this trout ”SOSKA POSTRV”. In direct translation it means “trout from river Soca”. After successful breeding in the recent past we can hope that this subspecies, form or whatever taxonomic category will finally prevail among disunioned scientists, will survive. 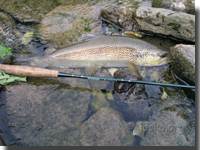 Younger example from Idrijca river caught on dry fly. Notice redish pattern. 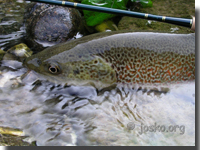 Personally I do not agree with few scientists in the past that classified marble trout as a “species” because it is a fact that it can be crossed with brown trout and the descendants ARE fertile! This is still is the rule #1of the biology and at least for now I think we should live it that way. 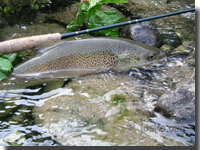 So these two forms of trout must be the same species if we follow the biological definition of the “species”. No matter if it is a form, subspecies or whatever, I think we all agree that it should and must be preserved. Let's rather say a word or two about marble trout's unique appearance. 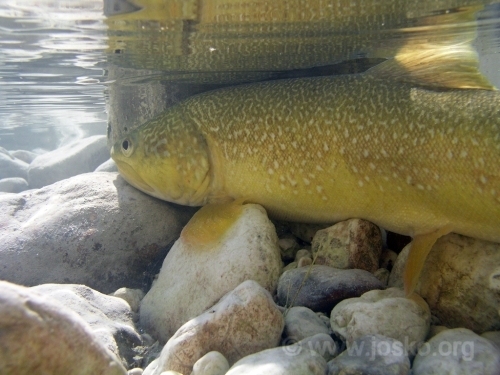 The most recent genetic studies revealed that in fact we could have several different types of marble trout in Slovenia. The best part is that all of them can grow to very decent size for every flyfisherman! Because on a “right” day, specimens around 35'' (90cm) can be seen in those rivers. But like I said, they can be easily seen - not caught! Carrying genetic heritage of (most probably) the same ancestor as our brown trout, it is one of the wariest fish among salmonids. 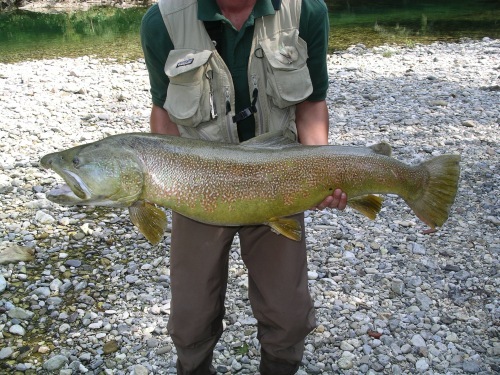 Although most of the fishermen still acknowledge only one type of marble trout as “genuine one” and that is now called “Zadlascica” type. It is named after Soca's famous tributary where natural barriers seemed to keep our brown trout (Salmo trutta f. fario) away, providing a habitat for detached population. This type is olive-brown or olive-green with that special marbled pattern which sometimes goes way down to the belly. 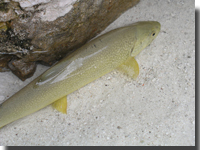 The color of the belly is usually yellowish-white or olive. Variability of shadings is incredible! They can be so pale that marbled pattern is hardly seen and on the other hand very dark too. This type has no red spots on the body! Some years ago all the fish with marbled pattern with at least one red spot were estimated to be “crossings with brown trout”. Now they seem to be a type of marble trout as well. “Real crossings” just add their share to the confusion. Usually the biggest specimens live in deeper water or canyons, well hidden from the fishermen. Especially in river Soca. They are territorial and as they grow they start feeding on fish. As every decent predator this fish has also very sharp teeth. All that makes flyfishing for big marbles very difficult considering use of barbless hooks and flies that can reach them. Getting deep enough in fast water is not very easy as we all know and tackle must be strong enough too. 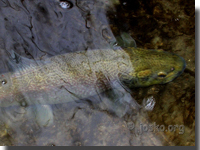 Unfortunately “catch &release” is not a very common regulation in our country, but as it looks it is slowly becoming the policy of the future of the slovenian flyfishing. Now we are able to keep one marble per day with a size limit over 40cm (somewhere 60cm depending on what river we are fishing). So at least fish under the size limit must be released. 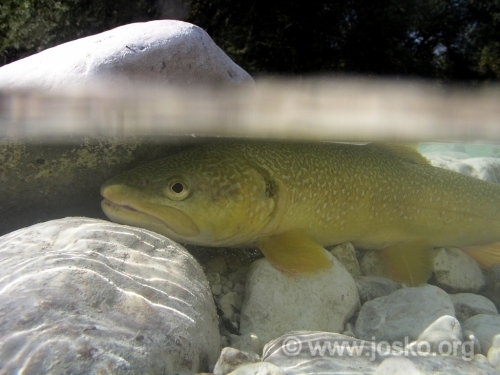 Marble trout has recently become interesting trademark of Slovenian flyfishing. 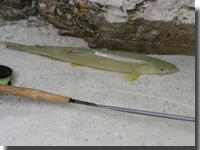 Due to the work of devoted domestic and some foreign scientists from different parts of Europe, especially from France, it seems it will remain in our streams and keep bringing flyfishermen from all over the world to our small and beautiful country. This page is purely informative. New photos if marbles cooperate!